When he is conducting a performance at L.A. Opera James Conlon gives the pre-opera talk. He is charming, witty and knowledgeable, making him a very popular man. More importantly, he has the potential to create a much bigger role for the orchestra and the music in the minds and hearts of his audience. And often he does. After all, opera is much more than the thrill of a singer squarely hitting a high note (though an even bigger thrill is when he or she cracks or does not quite make it). When a finely sung note is placed in an expressive musical line colored by the sounds of the orchestra it assumes emotional stature. Add to this a situational context – the physical attitude of a singer within an environment that completes a human story – this is real opera. Maestro Conlon in his talk on Lucia di Lammermoor wanted his listeners to know that bel canto means beautiful voices. He did not say beautiful singing. In the examples he chose to illustrate his sketch of the bel canto style he used the golden voices of the last century, those who sang in the big houses around the world – tenors Domingo, Pavarotti, and Di Stefano, sopranos Maria Callas (though the maestro qualified that it was not a beautiful voice) and Joan Sutherland (though the maestro qualified that she does not form words when she sings). Opera has come a long way since these artists were thrilling audiences with beautiful (except Maria Callas), exciting voices and magnificent high notes. But it certainly was not voices like these that we were to hear once inside the Dorothy Chandler. Lacking golden age voices these days we hoped we would hear voices that would thrill us with bel canto style, singers who would sing beautiful music, and sing it beautifully. Some of us were not sitting there just to be amazed by a lot of quickly sung notes and a grand high note or two at the end of an aria so that we would wildly applaud. But according to Maestro Conlon’s pre-opera lecture that was exactly why we were there. The situation at opening night was exacerbated by minor press being seated in the upper reaches of the Founders Circle (well past the end of the alphabet). From the best of its seats the Dorothy Chandler does not offer beautiful sound and sitting under the balcony overhang in the Founders Circle we were offered minimal though harsh orchestral sound supporting huge, acoustically magnified voices. After intermission we moved into a couple of the many empty seats closer to the stage. It was better. One can accept the acoustical quirks of theaters. It is much harder to accept poor harp playing (Donizetti’s extended harp obligato was nervously played, and flubbed) and lack-luster French horn playing (in his pre-opera talk the maestro had used the horns of the Vienna Philharmonic). It is very hard to accept singers who are not initiated into the bel canto style, or singers who are not of the appropriate voice. Bass James Creswell is not a basso cantante, nor a singer equipped to hold the stage in exposed starring roles, baritone Stephen Powell’s program book repertoire includes no bel canto roles, nor does he have the delicacy of voice and temperament to approach such roles. The small roles were taken by singers from L.A. Opera’s young artist program – boys sent in to do men’s work. It was a new production directed by Elkhanah Pulitzer who has credits as an assistant director at the operas of Los Angeles and San Francisco. The concept seems to have been based on the misconception that bel canto is presentational; therefore, singers face forward and sing with little or no need to move. The female chorus, identically dressed, made silly synchronized movements and peculiar hand and arm motions as if the music were mechanical, these movements attributed Kitty McNamee. The set was designed by Carolina Angulo, the “design manager” at L.A. Opera, perhaps her professional debut. The visual concept was abstract, hard-edged shapes in bright primary colors, there was a dominant projection of a white circle, presumably the Scottish moon, sitting on a symmetrical blue semi-circle, and other abstract projections, maybe they were trees, by Wendell K. Harrington. There was not an iota of bel canto in sight. 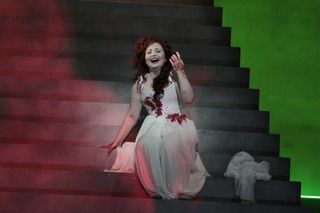 Russian soprano, Albina Shagimuratova is a formidable Queen of the Night, thereby well able to negotiate the high fast notes that portray Lucia’s madness. But there is a softness as well in Lucia, a suspension of voice and feeling that Mme Shagimuratova does not find. Working counter to the staging conception, she attempted to create high acting drama that included countless full body falls. The same may be said of the Edgardo of Albanian tenor Saimir Pirgu. This fine young artist needed direction on the stage and from the pit to keep his performance from deteriorating into senseless opera singing and acting. James Conlon is a unique and powerful musical force who does not seem to have a sensibility for bel canto.